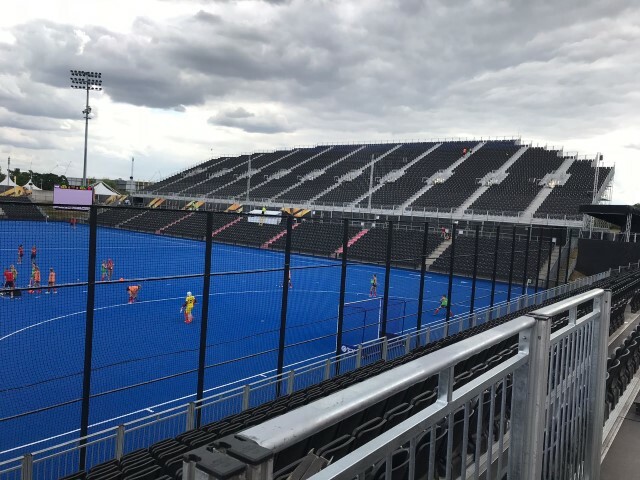 When the 14th edition of the Women’s Hockey World Cup was held at Lee Valley Hockey and Tennis Centre from 21st July – 5th August 2018, Showforce provided crew members with various skill sets to both Arena Seating and ADI. Showforce supplied Arena Seating with a team of 12 which included crew members, climbers and plant operators from the 15th June – 13th July. In action for almost a month, they assisted with the installation of an impressive 6,000 seat grandstand that increased the venue’s capacity significantly. They were tasked with erecting scaffolding and installing the seats themselves, the plant operators Showforce provided included counterbalance, RTM and telehandler drivers. Whilst some of the scaffolding work was low level, a lot involved working at height with site crew unloading heavy kit, lifted into position by the plant operators and passing it to the climbers. The scale of this project was huge and extremely challenging for the crew. Once the installation of the grandstand was finished, the crew wiped down seats and left the area tidy ensuring it was ready for the event to begin. In total, the Showforce team amassed 3,023 man hours for Arena Seating. An additional team of six Showforce crew members worked for ADI to assist with the install of a large electronic score board inside the stadium, along with advertising hoarding around the pitch and inside the stadium. They returned to site on when the event was over to begin the de-rig, despite being informed that the time allocated was less than they expected, the team took this news in their stride and ensured that the job was completed well ahead of schedule.